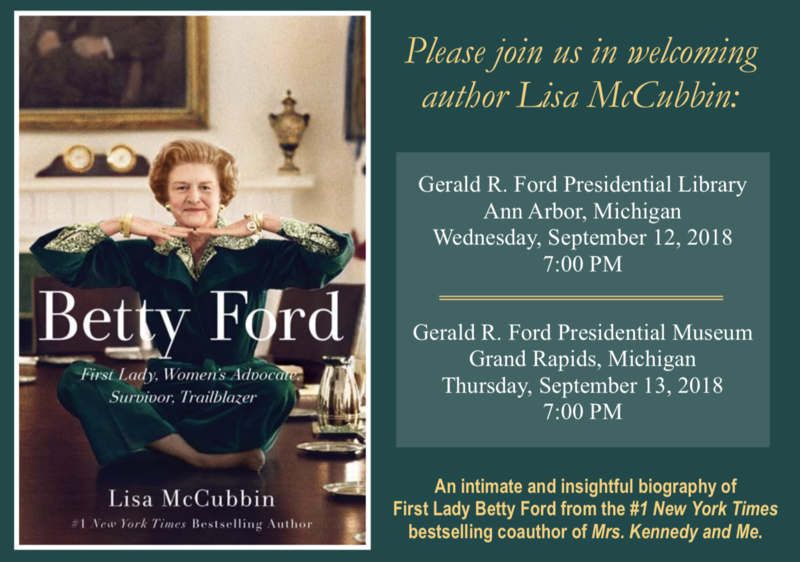 Join Lisa McCubbin, award-winning journalist and the author of numerous New York Times bestselling titles, as she discusses her newly released book on Betty Ford. Betty Ford: First Lady, Women’s Advocate, Survivor and Trailblazer is based on intimate in-depth interviews with family, friends, and colleagues of Mrs. Ford. McCubbin reveals a fiercely independent woman who had a lively sense of humor, unwavering faith, and an indomitable spirit — the true story behind one of the most admired and influential women of our time. Reservations required for Grand Rapids only: Reserve your space through our Online RSVP Link, by calling 616-254-0384 or emailing ford_events@nara.gov. (Reservations are not required for the Ann Arbor presentation). Book sales and signing following each presentation.